We have already talked about being wired for problems. We all have different styles, and some behavioral styles have this uncanny ability to scan the environment for problems. At first this sounds negative. Always pointing out what is wrong. But there is a flip side to having a style or mind that is wired to discover problems. That same mind or style is also wired for solutions. The more I work with people about their style, the more they need to see these two sides. Not everything about our style is positive. Sometimes we don’t always like everything about our style. But our styles have two sides. You may be more prone to follow the rules, and that same style promotes excellence and accuracy. You may be prone to be talkative and social, and that same style can move people to believe, and hope, and dream. You may be prone to be a little scattered or distracted, and that same style breaks out of the status quo and moves organizations forward through change. You may be prone to focus on the task or the process, and that same style will build organizations that can scale. Knowing who you are, and your style is the first step. If you haven’t taken one of these assessments, contact me and let’s find how you are wired, and how you can make the most impact in your world, your business, and your journey. When working with teams about their collective behavioral styles, I have noticed that in the long run there are only Two Teams. As I check in with various teams’ progress at certain intervals the Two Teams have two distinct results. Team One is doing well. Team Two is actually worse than before. Unfortunately there doesn’t seem to be a middle ground. Team One is communicating differently, achieving results, and having less conflict. 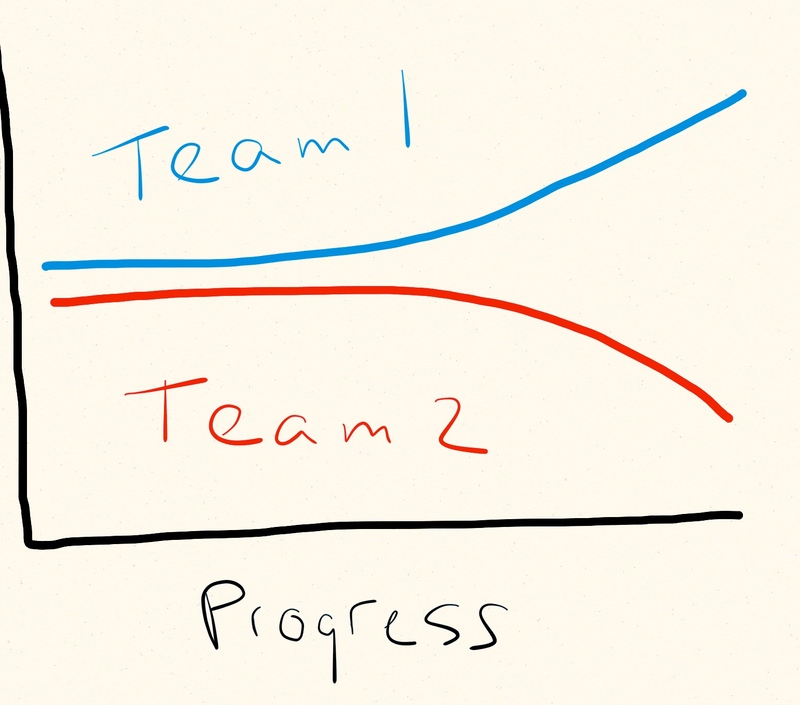 Team Two is communicating differently, not achieving results, and having more conflict. What separates these Two Teams? Why does Team One prosper and Team Two decline? The answer was simple. After a series of meetings, calls, and follow-up visits a pattern developed. I took notes of each group but the difference became clear. After the initial session, each member of Team One reflected on their own primary style. They made a list of what worked for them as a member of Team One. They made a second list of what didn’t work or needed modification in order for them to be a better member of Team One. Over the next few months each Team One member worked on what didn’t work and tried to leverage what did work. After the initial session, each member of Team Two reflected on their primary style. They made a list of what worked for them as a member of Team Two. They made a second list of what didn’t work or needed modification in order for others to be a better member of Team Two. Over the next few months each Team Two member worked on trying to get others to change their behaviors and style and did not focus on how they could change. Will you focus on how you can improve to make the team better? Will you make a list of how much better things will be when other people change? The choice is simple when you realize there are only Two Teams.